UC Santa Cruz is one of the 20 greenest colleges in the country, according to the Sierra magazine’s “Cool Schools” ranking. Sierra magazine, the national magazine of the Sierra Club, today released its 10th annual “Cool Schools” ranking of America’s greenest colleges and universities. UC Santa Cruz is one of three UCs to be in the top 20. More than 200 schools participated in Sierra’s extensive survey about sustainability practices on their campus. Using an updated, customized scoring system, Sierra’s researchers ranked each university based on its demonstrated commitment to upholding high environmental standards. Sierra magazine wrote, "Thanks in part to a group called Students for Organic Solutions, 33 percent of UCSC’s cafeteria budget goes toward organic ingredients that were produced no farther than 250 miles from Santa Cruz, including from the university’s own 30-acre farm, where students learn how to grow pesticide-free food. "The Banana Slugs also run their own bicycle library, and the school reduced its water use by 36 percent between 2005 and 2015.The campus is full of old-growth redwood trees and wild deer, and boasts epic views of the Monterey Bay." UC Santa Cruz earned 670 points, with a perfect score in “Innovation.” In its report, the campus cited its work toward becoming zero-waste, its participation in the Cool Campus Challenge, its creation of a carbon neutrality roadmap, and the ambitious plan developed by UC Santa Cruz researchers to use the UC Natural Reserve System (NRS) to detect and forecast the ecological impacts of climate change in California. Kristy Kroeker, assistant professor of ecology and evolutionary biology, was awarded a $875,000 Packard Fellowship for Science and Engineering by the David and Lucile Packard Foundation. 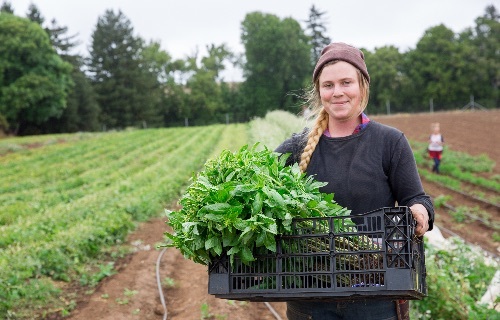 The U.S. Environmental Protection Agency recognized the waste reduction accomplishments of UC Santa Cruz Dining Services, a participant in the EPA’s Food Recovery Challenge. College of the Atlantic earned the top spot. Other UCs that placed in the top 20 include Irvine (No. 3) and Davis (No. 8). The full ranking of 202 colleges, including each school’s completed questionnaire, can be found online.